When Namibia together with South Africa, Botswana, Mozambique, Swaziland and Lesotho, the so-called SADC EPA Group, signed an Economic Partnership Agreement (EPA) with the European Union earlier this month, it was only a day after the South African president announced that a ministerial retreat will be convened for the members of the Southern African Customs Union. These developments are too close to be coincidence and it smacks of a pre-emptive move by the South African government to salvage its waning control over the region through the customs union. It is obvious that five of the six EPA signatories are members of the customs union while four are signatories to the so-called Common Monetary Agreement, the CMA. The independent Trade Law Centre, based in South Africa and headed by the junior partner in the trio of lawyers that drafted the Namibian Constitution, Gerhard Erasmus, this week quoted extensively from Zuma’s 09 June statement, saying that the intention of the ministerial retreat is to turn “SACU into a vehicle for regional development which will benefit all the SACU members …. [including] building regional infrastructure, supply-side capacities, industrial development and value chains to stimulate regional growth and development”. Now, if SACU is punted as the intended vehicle for regional integration, then what business does Mozambique have as a member of the SADC EPA Group? I have to admit, the motives behind Zuma’s announcement are not clear, but it is significant that he stated that the ministerial retreat (to be convened) will only take place after consultation with the other members of the customs union. The Southern African Customs Union has been beset by numerous disputes since 2002. The detail on all these legal, political and economic issues can be found on Tralac’s website at tralac.org so it is superfluous to repeat them here. 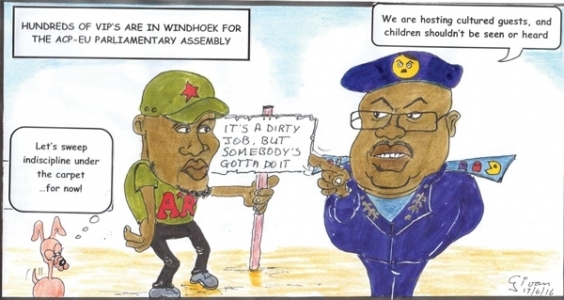 Tralac points out that the ministerial retreat is long overdue, mostly because a proper legal framework is lacking and this includes a tribunal similar to the now-defunct SADC Tribunal of which the white elephant building still stands in Windhoek’s central business district. The biggest obstacle to SACU to turn from a customs union dominated by the biggest partner, into a “vehicle for regional integration” is exactly the difference in size of the member economies. For us in particular, the main bone of contention is the 2002 SACU Agreement, which grants benefits to the smaller members out of proportion to their contribution to the customs and excise pool. The South African government has for more than ten years expressed its dissatisfaction with this agreement, throwing many hints at us, and the other small members, that it has to be renegotiated. This, however, never gained much traction since our disproportionate benefits, are still peanuts compared to the bigger South African trade picture. But when the South African economy started tanking last year thanks to extensive and aggressive Zumantics, then suddenly its relationship with its smaller SACU partners became an issue again. “The essence of the present impasse involves two diverging sets of expectations and different approaches regarding a potential solution. The official view of the BLNS countries is that the 2002 SACU Agreement is a binding legal instrument to which all Members have agreed; it should be implemented. The outstanding institutions (especially the Tariff Board, National Bodies, Common Negotiating Mechanism and the Tribunal) should be established and become operational. South Africa, on the other hand, is on record that it cannot allow its national interests (and in particular its policy space to use the import tariff as a policy tool of its industrial development) to be subjected to a supra-national organ and consensus decision-making” according to Tralac. I am not too convinced that South Africa is sincere as co-signatory to the EPA with the EU. They enjoy much closer historical ties with the EU than any other member, and the tension I sense between the EPA and the 2002 SACU Agreement makes me wary. The SACU ministerial retreat should be an enlightening event, provided we can learn what is actually discussed there.